TIG welding involves the use of consumable tungsten electrode and electrical arcs in the creation of connections between metallic surfaces. 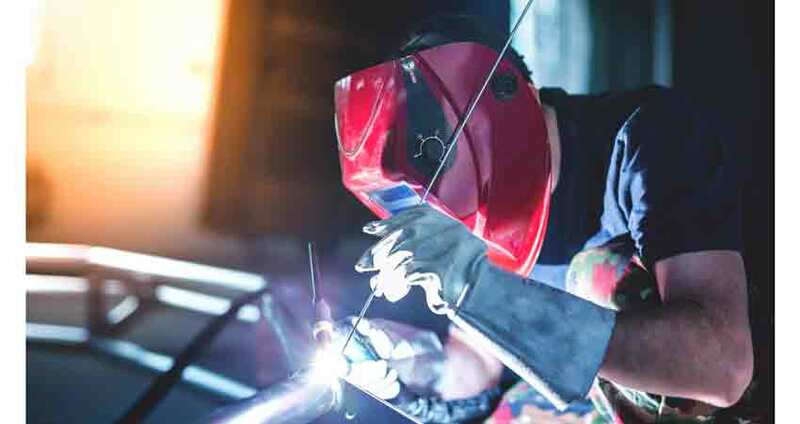 As the most preferred welding method due to its quality and long lasting finishes, TIG welding uses a shielding gas within your working space to create clean connections. FYI: Conventionally, TIG welding is known as GTAW (Gas Tungsten Arc Welding). How Can You Apply TIG Welding? Which Is More Suitable For Thicker Metals? If you frequently work with light metals or stainless steel, TIG welding is the best way to go. The integrity of these objects and metals requires light welding to remain intact. When it comes to controlling the strength of your welds and the final outcome, this type of welding has the easiest process to follow through. Though it will take you longer to complete your project, the strong welds are the most effective and give you value for money! When learning what is TIG welding, I’ve heard some people say it’s a bit complicated, that’s relative. Shielding Gases – Typically, gases used are helium or argon, the latter is preferred. Welding Torch – Depending on your preference, the welding torch can be either automatically or manually operated. For the heat to be transmitted effectively, these torches are made of brass or copper. Electrode – To avoid damage during welding, a tungsten electrode is used. This material’s melting point is the highest. Alternatively, one can use tungsten alloys. Power Supply – As the operator, you will be holding the torch throughout. Your power supply must be constant as completing projects will take longer. Depending on the materials and particular project needs, the voltage you require varies. To tame variable temperatures, alternating current is used. While it is mostly used for stainless steel, magnesium, and aluminum, it can also be used for almost all metals. It will only fail to work with zinc and lead. For the formation of a strong, long-lasting bond, the metals you’re joining should have similar properties. The types of TIG welding one can use include pulsed-current, hot wire, and dabber. Pulsed-current will work best with thinner and smaller projects and is powered by alternating current. Dabber welding is ideal for precision works such as building up blades on the thinly edged saws and mowers. In hot wire welding, the filler metals are heated prior to tossing them in the welding pool. When using this process, the energy supposed to be conducted through the arc is created from a stable power source. The metals are connected tightly together as the flame passes through metal vapors and a gas column. FYI: TIG welding offers you absolute control over the entire process; with it, you can weld through tighter spots that you would have otherwise been unable to. TIG (Tungsten Inert Gas) – It uses non-consumable tungsten electrodes. When running the current through metals to be joined, you might not have to use a filler metal. MIG (Metal Inert Gas) – This process will require you to feed a metal wire continuously into the weld; the wire serves as the filling metal. More often, MIG welding is recommended for its ease of use. Unlike TIG welding this process is more lenient on errors, this makes it ideal for non-professionals and first-timers. On the contrary, TIG welding calls for particularly strict control. For the best result, it is done using an automated CNC (computer-numerically-controlled) welding machine. FYI: To avoid repeating one mistake severally, one must get weld controls and settings precisely right; this applies to both processes. Since the MIG welding process uses a consumable filling material it is better equipped to complete thicker welds. In the absence of a filler metal, TIG welding has to get the metals hot enough for them to melt and join together as they cool. In general, TG welding is most effective when working with thinner metals while MIG welding is your ideal go-to option for thicker metals. Are you looking for a TIG welder with a digital computer? Whether you’re a hobbyist or professional welder, this model’s stick function allows you to accomplish various tasks quite easily. Weighing just about 40 pounds, the welding machine ha knobs for control rather than the push-button computer controls. This welder’s thoughtful design makes it not only excellent in delivering professional welds but also quite easy to use. While many of us rarely use the pulse feature when welding, it comes in handy when dealing with stainless steel. This machine delivers welds on 3/8” mild steel and ¼ inch aluminum ranges. With the latest Fairchild IGBT inverter technology, AHP Alpha TIG 200DX welder gives you the maximum output. Its anti-stick function is useful in dropping to 30 amps, facilitating easy stick lifting. As a dual voltage welder, it is comfortable to use for both novices and professionals. With it, you get quality TIG welding on stainless steel, aluminum, and other thin-gauge materials. This welder is fairly priced, giving you the opportunity to do thinner welds without having to hire professionals. It operates in different modes and accommodates your level of skill without demanding too much input. This is the best tig welder under 1000 and you can never go wrong with it. Tip: When operating with the foot pedal, use rubber shoes to maintain stability. As a versatile and fantastic portable welder, Miller Maxstar 150 STL works excellently on many materials. On its interface, the operator can switch between TIG and Stick modes, making it useful in small projects. If you need to move it around, the shoulder is comfortable enough to accomplish this without straining. The close-packed design makes operating this welder easy for starters; there won’t be a need for undesired cable cutters or lead extensions. To ensure the machine gives you years of quality service, the design features an LVC (Line Voltage Compensation) option; it eliminates potential hazards caused by fluctuating power by providing stability. You will find the interface exceptionally user-friendly. If your welding projects require you to be constantly on the move, this welder is a worthy companion! With among the most advanced inverter technologies on the market, TIG-200DC gives you a more stable arc, it is strong and easy to concentrate. Depending on your welding needs, the arc can be made softer or harder. Even when working on shorter pieces, the welder’s response was quicker. If you work with a wide range of materials, the machine will work well with carbon steel, copper, stainless steel, and several other color metals. It also doubles up as a useful traditional electric welder. Are you always faced with a nasty mess to clean up every time to weld? This machine is thoughtfully designed and collects all post-weld and spatter. This not only makes your welds smoother but also protects your welder from damage. When working with it, the 12 ft. long power line feeds the 10 ft. 300A electrode holder, giving you adequate room to work. When it comes to duty cycle, voltage control, and arc quality, very few welders match up to TIG-200DC. With the convenience of welding up to 3/8” on materials like chrome, cast iron, mild and alloy steel, all your welding requirements are made possible. Its 93% transfer efficiency makes it one of the most powerful welders in its category. This fantastic welding appliance has a unique single-knob controller, making it one of the fastest and easiest AC/DC TIG welders on the market. I found it exceptionally easy to assemble and start operating. To start, all I had to do was choose thickness, attach the inert gas, and plug into your VAC power outlet. When compared to other welders in its category, Hobart EZ TIG 165i offers you more features. Your welding is easier and more accurate. In weld performance, this model has a gauge running from 22” to 3/16”. When running on AC, it welds aluminum superbly. When in DC mode, you can weld stainless steel and Chromoly. This welder design for places which offer fabrications and auto body repair services. With its fan-on-demand feature, you can work on projects continuously without overheating and consuming too much power. With its numerous facilities, this TIG welder is also ideal for vocational training. Novice welders are able to quickly learn the ropes. As the easiest TIG welder to assemble and use, this model offers you a rare convenience. I was able to finish perfect welds though it took considerable time and effort. The robust performance in welding results in long-lasting outcomes of high quality. The Hobart EZ TIG 165i Welder is the best tig welder under 2000, it can be one of the best choices for beginners. FYI: The event that the welder experiences extremely high temperatures, it automatically shuts down to prevent the potential extensive damage and harm. Note: As long as the user follows instructions, a TIG welder is a safe tool. You need best welding helmets extra safety. Its light produces excessive heat; you should be appropriately dressed and maintain a safe distance during operation. If you have never used a TIG welder before, getting used might take some time and effort. While some functions of the welder are reserved for higher-specification machines, common parameters are uniform across TIG welding. Starting your welding sequence is as easy as flicking the switch on your TIG torch. Before commencing, the machine automatically opens inert gas valves for o.5 seconds. Your output current increases as soon as the arc starts. Q: Why Should You TIG Weld? A: TIG welding offers you the widest variety of metals to weld when compared to other procedures. Its welds are also among the strongest and cleanest. When using it, there are no fumes, spatter, sparks, slag, and smoke. If any of these happen, the project wasn’t clean properly before welding. Q: Which Gases Should Be Used? A: If you are after achieving deeper penetration, Helium is a good option. Otherwise, Argon use for almost all welding requirements. Q: Why Does Tungsten Contaminate Many Welds? A: This happens when tungsten melts into the weld puddle; you should switch your electrode for one with a bigger diameter. Another likely cause would be holding your torch very close to the weld, dipping it unknowingly into the puddle. Q: Why Does The Tungsten Have Yellow Smoke Or Powder? A: When the shielding gas is inadequate, the tungsten will react with the environment. Always ensure your gas bottle is decently filled and maintain a flow rate of 15-20cfh. Your post arc flow should also be right; using the wrong shielding gases also causes discoloration. Q: What Is High-Frequency Start, Lift-Arc, and Scratch Start? A: The high-frequency start enables this machine to overcome resistance easily and fill the gap between the work surface and torch. The lift-arc significantly reduces the chance of contamination, so that ensuring your weld is at its cleanest. To complete this welder’s circuit, all you need to do is scratch its electrode on the surface you are working on. Q: How Does One Get The Tungsten Tip Ready? A: To get the tungsten working, you need to ground it into a lead pencil shape, you can accomplish this with a belt grinder or belt sander. The grinder should not use for other purposes. For more precise results, use an electric drill.